This exhibition of Fang Lijun’s new works opened on 18th December 2013 at Hanart TZ Gallery. 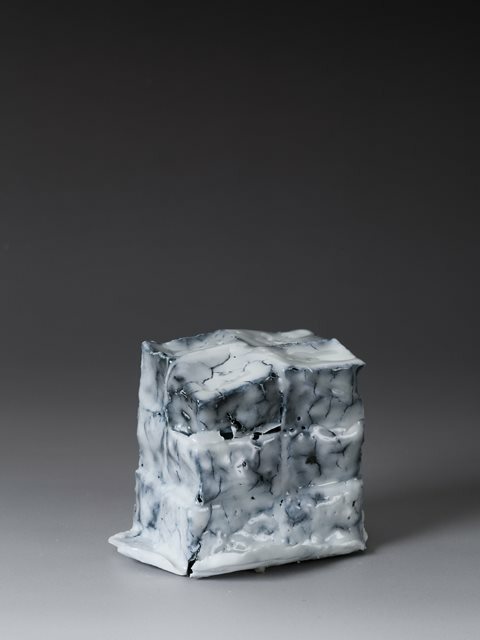 It showcases the artist’s latest works, including oil on canvas, works on papers and ceramic sculptures. 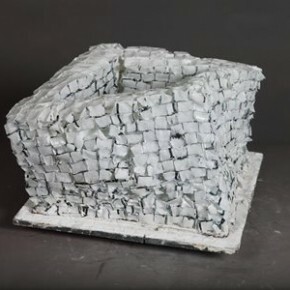 Since graduating from the ceramics department of the Hebei School of Light Industry in the 80s, this is the first time in Fang’s career he has returned to ceramics. 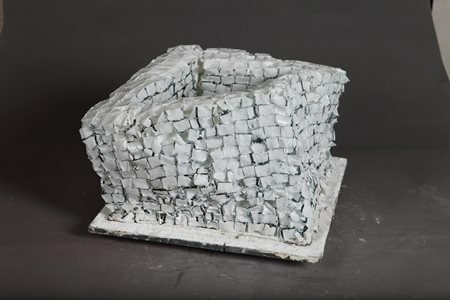 These ceramics constructions in a seemingly collapsing state highlight the material’s natural fragility, and bring to mind the vulnerability that underlie the buoyancy of today’s volatile political economy. 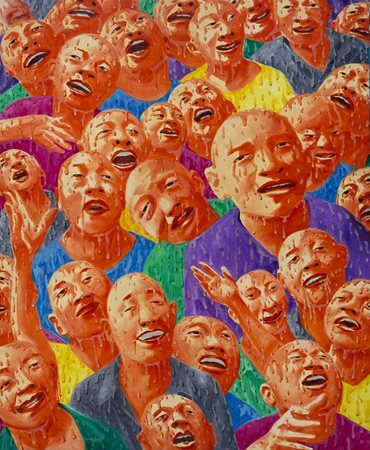 Few viewers coming to Fang Lijun’s art for the first time would not find it delightful. To the Chinese audience, the grand vision of the images, riotous profusion of colours and direct allegorical references, intimates memories long buried in the past. The work is seemingly easy to appreciate, but on close encounter threatens to reveal secrets best left untouched. The obvious reference is the visual political language of New China. Fang Lijun’s art refers to colours and imageries familiar to that generation with personal experience of Mao Zedong’s revolution. The multi-coloured peony blossoms, bright blue sky and festive joy that celebrate public unity, echo exactly the mood of Mao’s Socialist Revolution. This is the same mood one finds in North Korea, the Soviet Union and South America, and the same motifs repeat themselves: profusion of flowers, happy masses, festive celebrations; each differentiated only by its regional flora and native costumes. This is one dimension of Fang Lijun’s art that links the local with international idioms. For an artist who did not emerge until the late 80s, an obvious divide separates him from artists of the ‘85 New Wave art movement. The ‘85 New Wave artists mostly chose as their model Western trends of early 20th century; they adopted an avant-garde approach that celebrates individual style and seeks subversion of received traditions. Even when in fact most of them followed in the tracks of the West, and had not taken steps as daring as claimed, their position was idiosyncratic. 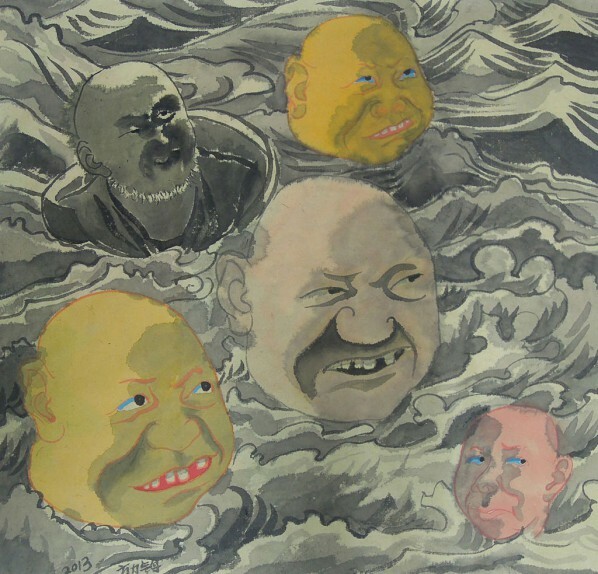 In the spirit of the time, Fang Lijun also established a style that was “modern” and “individual”, but the message he delivered was somewhat unusual. He focused on the “collective” that socialism pays attention to, and concentrated on figures with similar features. Intimation of socialist imagery and colour scheme that first appeared in 1993 grew increasingly explicit. Since the mid 1990s, Fang Lijun has employed this painting idiom and metaphoric imagery to explore the implicit nature of the worldview embodied in this artistic language. 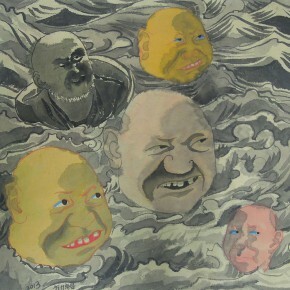 The symbolism and allegories in Fang Lijun’s art are not intended to confound. They seem to be intentionally straightforward. Whether it be socialism’s optimistic vision of historical progress, with a bright future promised by the gods on high, or the controlling hand of an invisible and almighty sovereign, these are familiar imageries or even real life experiences for viewers in a socialist country. 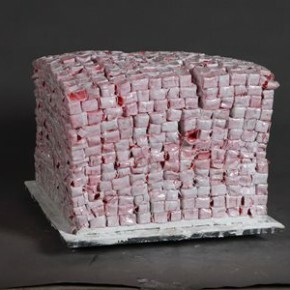 In recent years, his works show people collectively being entrapped or manipulated, while they are provided for in happy plentiful material wellbeing; which reflect the experience of individuals living in neo-liberal capitalist societies around the globe. 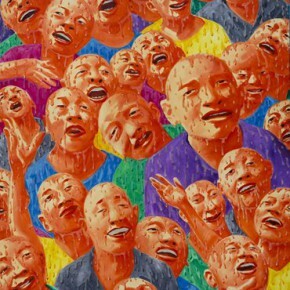 To quote Mao Zedong, Fang Lijun’s art fulfills what the public “loves to see and hear”. However, this “love to see and hear” is founded on his ability to export the idiom of socialist visual culture into the world of global capitalism. Fang is not only a skilful painter, he understands the power of the spectacle, and is able to intuit the global predicament through a personal perspective on today’s society. What is special about his perspective is the ability to grasp in artistic language the manipulation of the “collective” within the reality of a capitalist society. The fact that modern man is being disciplined and manipulated is not particular to socialism or capitalism, communism or democracy. 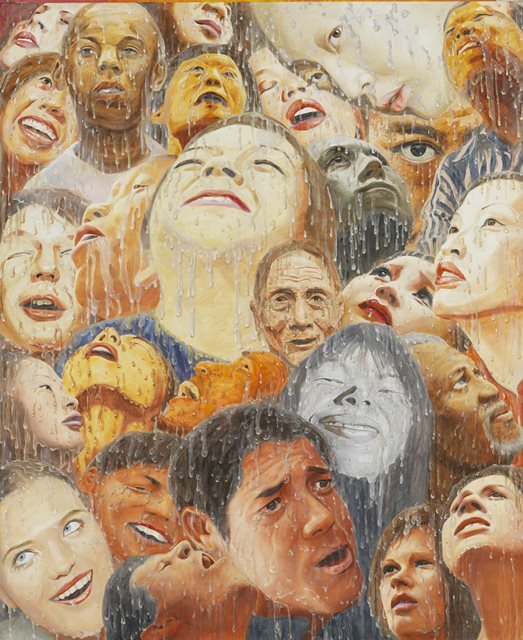 Fang Lijun’s insights cut right across the two ideologies to reveal secrets shared by both of these positions in modern daily life. 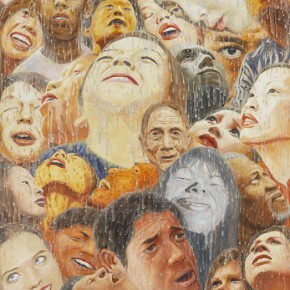 In the recent decade the work of Fang Lijun often hints at the manipulation of all creatures by a supreme being. The collective body gets manipulated by virtue of a converging force of historical purpose. This purpose drives the universe, and it is exactly parallel to promises made to the world by “modernity”. Through the arts, the modern world expresses its intention to lead man to a better tomorrow, and delineates the shape and colour of this future age. The ugliness and unpleasantness found in some of Fang Lijun’s recent works expose the dark side of this dream, and reveal the nature of the manipulating, controlling hand behind the scene. Whether it be the incitement of revolutionary fervour or the arousal of desire for material gains, the goal is the same; the end is the incorporation of individuals into collectives, turning the living multitude into manageable crowds. Mao Zedong’s “continual revolution” and the capitalist world’s management of desire ultimately meet on the same plane of institutional control. 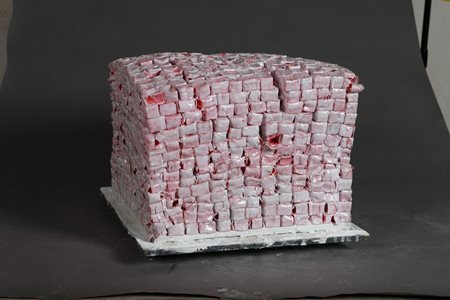 Courtesy of the artist and Hanart TZ Gallery, for further information please visit hanart.com or contact via +852 2526 9019 or hanart@hanart.com.